As well as featuring well-known dinosaurs such as T-Rex, Stegosaurus and Triceratops, Dino Zoo includes five Australian dinosaurs that have never before been animated with scientific accuracy —Queensland’s own Muttaburrasaurus, Kunbarrasaurus, Rhoetosaurus, Coelurosaur and Australovenator nicknamed Banjo. 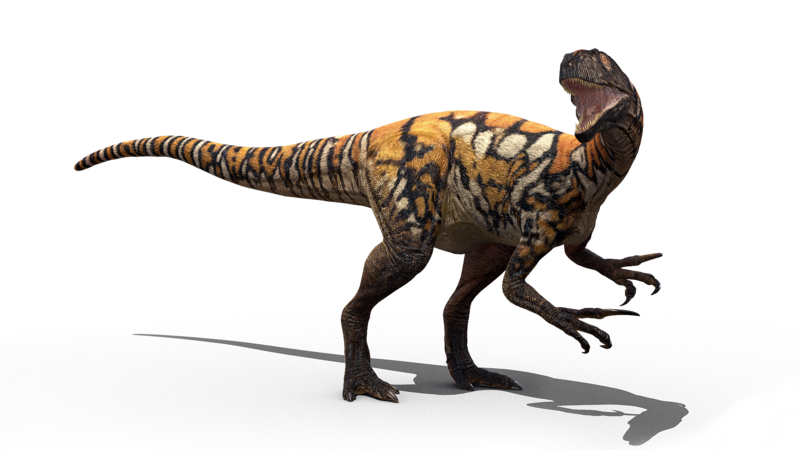 Banjo is an Australovenator Wintonensis. He is one of our home-grown heroes who was discovered in Winton, Queensland. Dr Scott Hocknull from Queensland Museum is famous for the classification of Banjo, and seeing his old mate finally living and breathing in the zoo has been a fantastic experience. 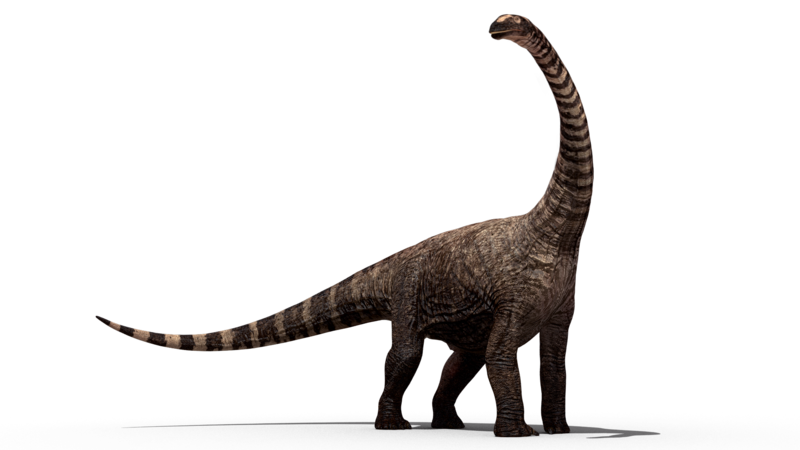 We have our own terrifying raptors, massive sauropods and even cute little ones that you’d want to have at home as a pet. We’ve always fallen in love with the famous dinos from overseas without fully realising that we have so many awesome ones on our own doorstep. Dino Zoo Holiday Program finished on 26 January 2016 however the Dino Zoo screening project will continue to run in rotation with other Cube projects. For more information on dates and times, please visit Cube Screens. Some of the dinosaurs in our Zoo are meeting each other for the very first time because, in reality, they come from vastly different time periods. Plus, not one of them has ever seen a human before! So we had to give our dinos a little social grooming to teach them how to interact with each other – and with you. The Cube team created a system to get the dinosaurs to consciously react to each other and to the Zoo’s visitors using a complex Artificial Intelligence (AI) system. 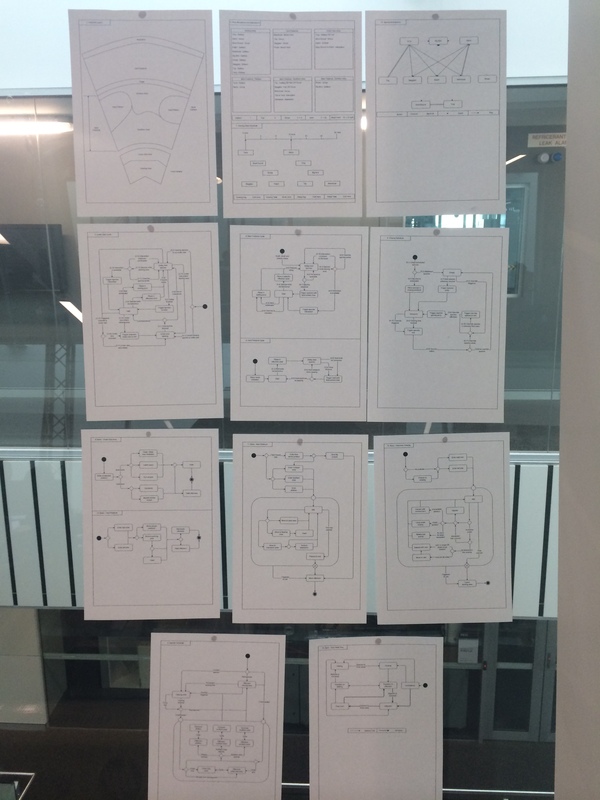 In these pictures you can see some of the behind-the-scenes work undertaken to make our dinosaurs smart! 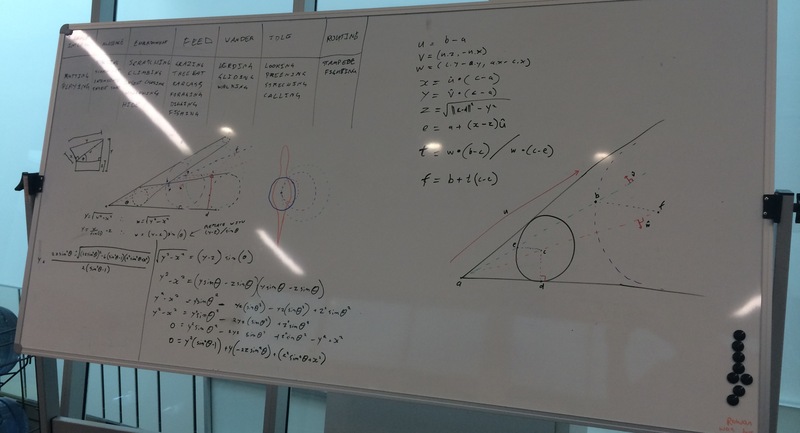 As you can see, there was quite a lot of heavy math involved for the AI. 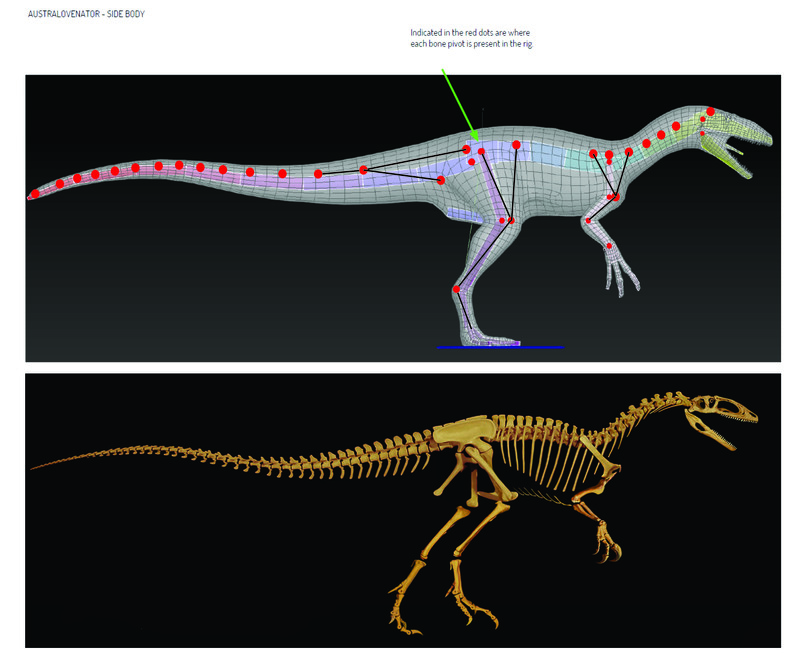 These images give you a taste of some of the movement equations and the decision maps used to help the dinosaurs navigate their way through day-to-day life in the Zoo. Recreating dinosaurs’ personalities and social habits is no easy feat! Well known Scottish paleontologist and performer Professor Flint stopped in to meet our digital dinosaurs last week. While he was here, he sung some prehistoric tunes from album Dinosaurs Down Under including Dinosaur Stampede, I want to be a Paleontologist, Rock and Bones and Australovenator. What do dinosaurs sound like? How do you capture the sound of creatures that haven’t existed for millions of years? 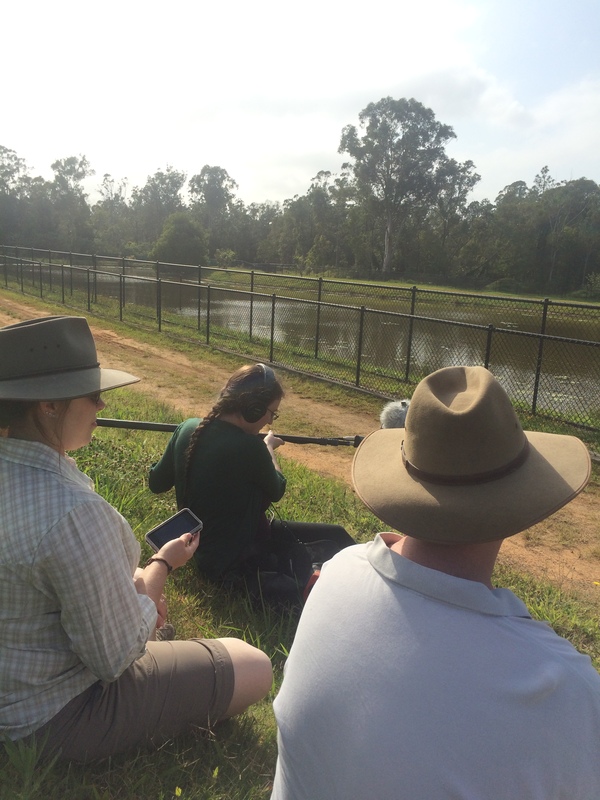 Some of The Cube team were lucky enough to head along to Australia Zoo to record some of the Zoo’s animals. 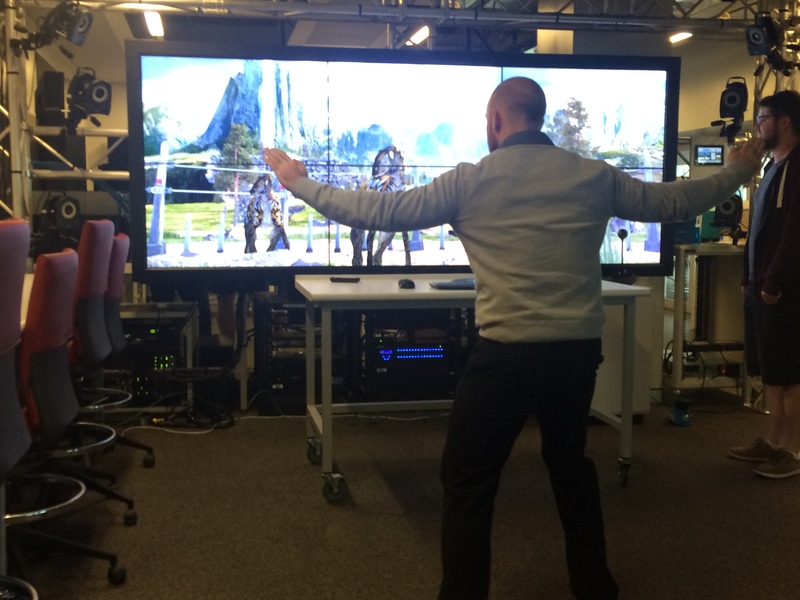 The Cube Studio Director Sean Druitt recounts this unforgettable experience. Sean: During the development of Dino Zoo, we’ve endeavoured to capture scientific accuracy at every turn. We’ve even painstakingly reviewed movement studies based off current research and understanding for the dinosaurs. So when it came to talking about the audio for the project, we knew we had to get that right as well. But what could we do? Dinosaurs have been extinct for a long time, and we don’t think any of them recorded a voicemail for us to use! Based on guidance from our good friend Dr. Scott Hocknull from the Queensland Museum, we were encouraged to use audio of dinosaurs’ living ancestors. Any animal that is phylogenetically bracketed from the dinosaur evolutionary tree would be acceptable. Birds, crocodiles, snakes and lizards all fall into this range. Scott indicated that, above all others, crocodiles and cassowaries would provide the most appropriate and rich sound pallet to draw from. We asked around the office but no one seemed to have any of these animals at home as pets! Luckily our good friends at Australia Zoo have all of these animals and more! So we packed up our audio recording gear and went for a magical day at the Zoo! 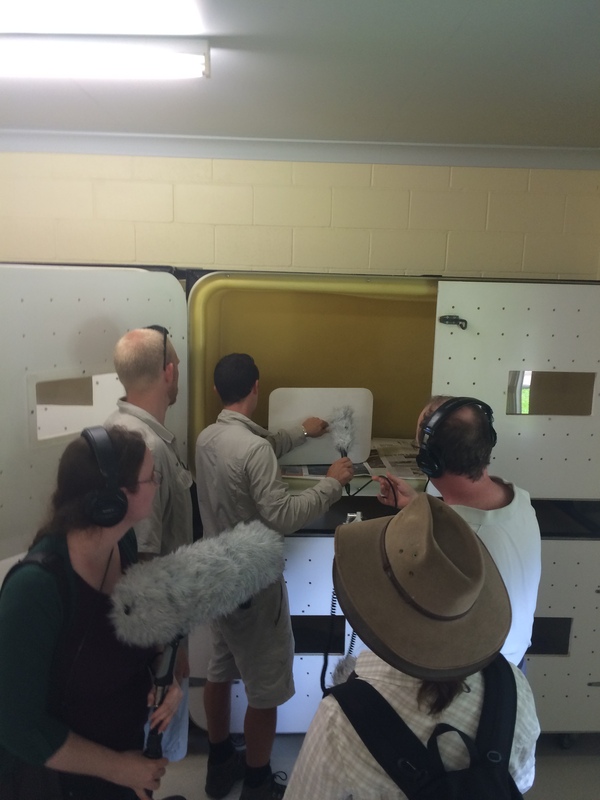 The team at Australia Zoo provided us with incredible access to the Zoo and its animals, enabling us to record audio before the Zoo opened to the public. This is normally the Zoo staffs’ one-on-one time with the animals to say ‘hello’ and give them breakfast in preparation for the day ahead. 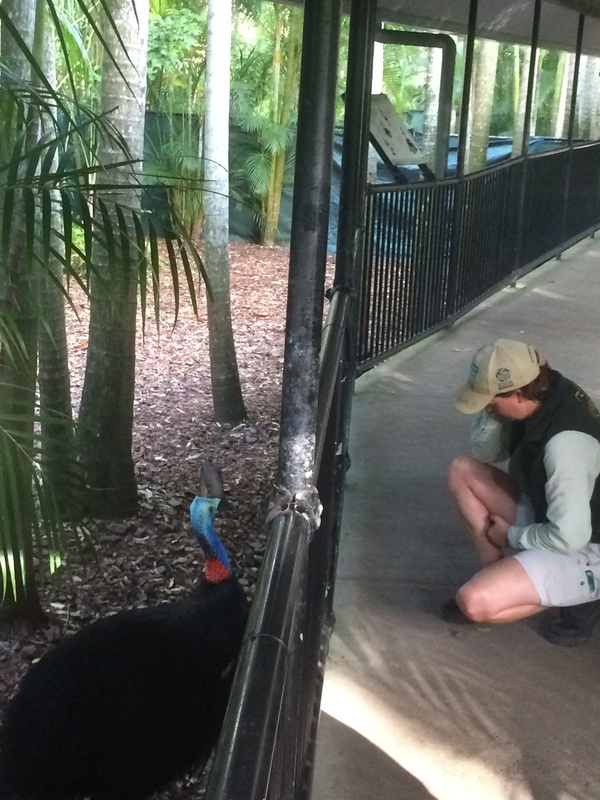 All the staff at Australia Zoo take great pride in their work and have a deep love and friendship with the animals. It was interesting to experience this special time which isn’t always accessible to the public. Some of the animals were a bit cautious of us at first. There’s nothing like having strangers point microphones at them… but we are happy to say that they warmed up to the idea and we got some great results! We captured a wide variety of chirps, tweets and calls across several bird species, including the elusive cassowary (thanks Jodi!). We captured snakes and lizards hissing as well. Terri Irwin even supplied some crocodile audio recordings from a recent trip to far north Queensland, how cool is that!? A massive thanks to Terri Irwin, Kelsey Engle and the rest of the Australia Zoo team for the gift of your time and access – you’ve helped add another layer of realism to our Dino Zoo! They can see you… and standing still won’t help you! We said that we were making the dinosaurs smart… we may have made them too smart! They know you are there, even if you aren’t touching the walls of The Cube. This doesn’t seem to worry the herbivores so much, but we’ve got some apex predators in the zoo and they may think you’re on the menu! We’ve been able to prove that the T-Rex knows you’re there even if you stand still! How freaky is that?! Our dinosaurs will follow you, react to you and sometimes even try to get at you! We apologise in advance but we can’t control these dinosaurs. They’re bigger and smarter than we ever imagined! We recommend all visitors to the Zoo have their wits about them, and be wary of the raptors – even if you can’t see them, they are there and they can see you! We are excited to announce that The Cube’s next big thing, Dino Zoo, will be open to the public from 6 January! Visitors will be able to immerse themselves in the zoo, interact with the dinosaurs, and play fun activities on the touch screens. We’ll have five Australian and five international species living in our zoo, just on the other side of the glass. Some of the dinosaurs will move in herds, some will hunt in small packs, and some like to rock it solo. In these images you can see one of the dinosaurs we’ve brought back to life. This process involved animation rig positioning, ranges of movement, and the start of a walk animation using the final 3D model. In collaboration with Dr Scott Hocknull, Senior Curator of Geosciences at the Queensland Museum, we’ve ensured that all of our dinosaurs will move and interact with scientific accuracy. Nowhere in the world can you find dinosaurs portrayed with this level of accuracy! 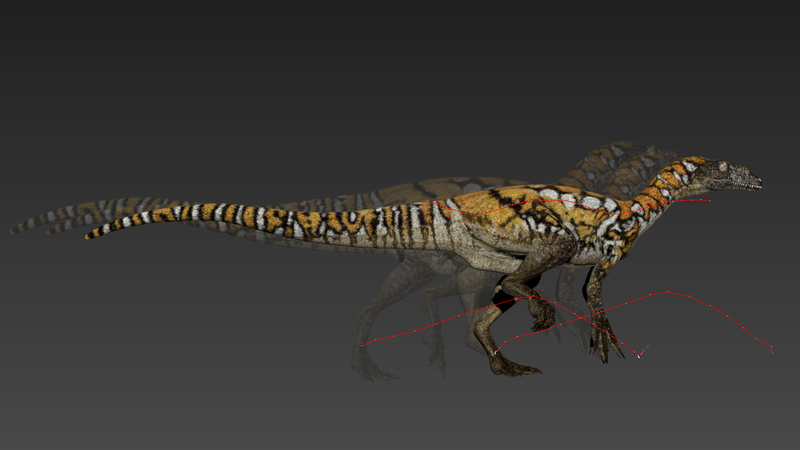 Banjo (pictured above) is an Australovenator Wintonensis. He is one of our home-grown heroes who was discovered in Winton, Queensland. Dr Hocknull is famous for the classification of Banjo, and seeing his old mate finally living and breathing in the zoo has been a fantastic experience. The journey from dig to digital has been close to a decade in the making for Dr Hocknull – not too long considering Banjo was last roaming around 65 million years ago! Stay tuned for more Dino Zoo updates!